Laurel Abraham serves at the Director of Development for the Liberty Justice Center (LJC), which pursues litigation that increases economic liberty, protects private property rights and enforces constitutional limits on government’s power. In her role, Laurel oversees strategic fundraising plans and individual donor outreach at LJC. To this end, she spends a great deal of her time meeting with people who share the vision of LJC. Before joining, Laurel served as the Director of Development for the American Legislative Exchange Council, more than doubling their financial support from individual donors. Prior to her work at ALEC, Laurel led development efforts at the American Spectator Foundation, where she created strategic plans for their programming efforts while earning her masters in Political Management from George Washington University. 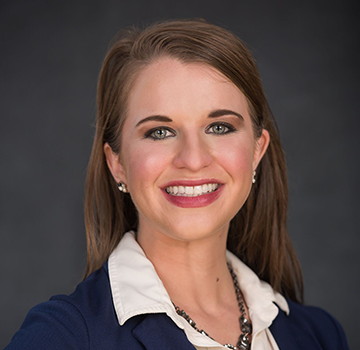 Laurel partners her passion for limited government and free markets by volunteering with like-minded organizations, such as America’s Future Foundation, where she sits as the Grand Rapids Chapter Leader. An Illinois native, Laurel enjoys working to protect the states’ taxpayers, while preserving freedoms for citizens all over the nation. Laurel currently resides in Grand Rapids, Michigan. "The Liberty Justice Center pursues its goals through strategic, precedent-setting litigation to revitalize constitutional restraints on government power and protections for individual rights."